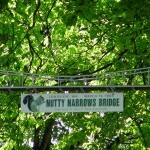 Longview, WA, is getting a second bridge at their First Annual Squirrel Festival August 6, when they’ll off a design contest to put up more squirrel bridges. Bald Eagle Hunting above Starved Rock. When I grew up in Illinois, seeing a bald eagle would have been impossible or at least fantastic. On January 2, my family and I drove just two hours outside Chicago and got to see seven bald eagles fishing on the Illinois River by Starved Rock State Park. More regular guests, jaded by appearances of over 100 eagles, walked away disappointed. We couldn’t have been more delighted.